In the unfortunate event of a divorce, families and their nannies are forced to acclimate themselves to an entirely new schedule. Adjusting to these changes can be difficult for an established nanny who has been with the family for years, and can be equally as confusing for a newly-hired childcare provider caring for the children of a couple whose divorce is very recent. If you’re divorced and employing a nanny, here are seven of the things you should make sure that your nanny knows about regarding the terms of your custody agreement. Scheduling Basics – Whether your nanny is just coming on board after a divorce or if she’s been working for you since before you separated from your ex, she will need to have a basic idea of your custody and visitation agreement. This especially holds true if she won’t be working during the time your children spend with a non-custodial parent so that she is able to build her own schedule as well. Which Parent They Work For – Some divorced parents will make separate childcare arrangements and others will make them together. When divorced couples share a nanny the arrangements can be complex and require a nanny to provide care at both parents’ homes. As such, your nanny will need to know who her primary employer is and what, if any, instructions they’ll be expected to follow from the other parent. Right of First Refusal Provisions – Provisions that grant non-custodial parents the first chance to care for their children when the other parent is unavailable are called “right of first refusal” provisions, and are relevant to your nanny because it can limit her work if they exist in your custody agreement. These provisions are put in place to allow a non-custodial parent to maximize the time they spend with their children, giving them precedence over a babysitter or nanny. If your nanny’s schedule could potentially be altered due to your ex’s insistence on watching the children when you’re unavailable, she should be informed as soon as possible. The Particulars of Your Parenting Plan – In the majority of divorce cases that involve the custody of dependent children, the parent who has physical custody is also the one charged with making decisions regarding childcare and schools, and often determines what is considered “reasonable” regarding visitation schedules. Your nanny should be aware of which parent makes these decisions and the ways in which they will affect her as spelled out by your parenting plan. About Supervised Visitation – In some unfortunate cases, a non-custodial parent is awarded visitation only under supervision, either by an agreed-upon party or a person designated by the court. 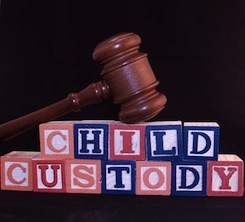 Often the result of substance abuse or violence on the part of the non-custodial parent, these situations can be particularly tricky for childcare providers. If your ex-spouse is only allowed access to your children under supervision, your nanny should be informed so that she doesn’t inadvertently facilitate an unsupervised visit. If a Parent Has No Visitation Rights – Should your ex-spouse’s visitation rights be stripped and sole custody awarded to you in your divorce agreement, this information should absolutely be passed along to your nanny. Child Find(R) of America estimates that up to 78% of kidnappings are committed by non-custodial parents; if there’s any chance at all that your ex could be considering the option of abducting their children, your nanny needs to know so that she can be vigilant, both for the well-being of your children and to ensure her own physical safety. Pick-Up and Drop-Off Protocol – Some divorces are more amicable than others, with parents more than capable of comporting themselves in a civil or even friendly manner long enough to arrange drop-offs and pick-ups. Others may find that keeping their temper or bitterness in check, even for a brief period of time, is almost impossible. In these cases, you may opt to arrange for these meetings to be handled by your childcare provider, but she should be well aware of that situation and given the chance to accept the arrangement in advance. You and your ex-spouse should agree, if on nothing else, to keep conversation civil and refrain from making snide comments about one another to the nanny, who is essentially a neutral party despite who signs her paycheck. Like every marriage, every divorce is different. There will be particular situations applicable only to you and your family and others that are dictated by the laws of your state; regardless you should make sure that your nanny is left as well-informed as possible to prevent any confusion or melodramatic scenes in the future.